BASIC PLAYING DEMO Click here for a demo of how to play a bowed psaltery. The video will show it's simply a matter of having the letters to the notes and playing the letters. PLAYING THE SLIDE Click here to see how to create beautiful slurs and glissandos on a bowed psaltery. TWO BOW HARMONIES Click here to see how to play two bow harmonies on the psaltery. PLAYING FAST SONGS Click here to see a two bow technique for playing faster songs. 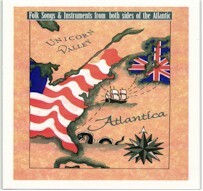 ATLANTICA -- Folk Songs And Instruments From Both Sides Of The Ocean Available in CD and Cassette. Use the links below to hear samples of songs from our ATLANTICA CD. The samples will let you hear how the psaltery sounds by itself and when played with a variety of instruments, including guitar, harp, fiddle, cello and recorder.